Absent lobule before and after surgery. Corrrection of the upper pole was declined. 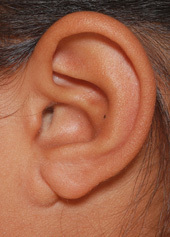 Earlobes may be small, absent, bifid (split). This may be associated with other anomalies of the ear or an isolated condition. Most of these conditions can be surgically corrected as day procedures. 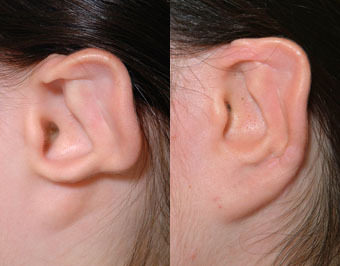 Earlobes can become stretched or torn from earrings and develop keloid scars after piercings. Information on these conditions can be found here.